Snow is falling in Western Washington, possibly the most we’ll get this season. The lowlands will get more snow with this system than they have in a decade, and I am taking full advantage by sledding with my kids right out the front door. But I can’t keep my mind off the forests of the Cascade Mountains. I am grateful that snow is piling up in deep drifts. Those drifts will become the lifeblood of our rivers this spring and summer. Ecologist Emily Howe leads The Nature Conservancy’s snowpack research in Washington. Photo by Hannah Letinich. Not all winters yield deep snows. In 2015, Washington faced one of the worst droughts on record. Streambeds ran dry, crops failed, and fisheries closed. It felt more like California, but It wasn’t rain we missed. In fact, it rained 7 inches above the norm. This was a snow drought. In the Pacific Northwest, recent El Niño events have brought precipitation—and warmer temperatures. El Niño winters are marked by moist systems that drop more rain than snow in the mountains. By the time winter passes, there is not enough snow to stoke meltwaters and feed rivers. The good news—and the bad news—is that these warmer winters give a crucial glimpse into Washington’s future climate conditions. We don’t often think of Washington as drought-prone. Our moss-drenched coastal towns boast upwards of 117 inches of rain per year. But on the eastern slopes of the Cascade Mountains, it’s a different story. Ponderosa pines give way to sagebrush in the open skies of the Columbia Basin. A good year brings 9 inches of rain. The Yakima River runs through the heart of the Yakima Basin, fed each spring by melting snowpack that supplies 75% of water runoff in the valley. A healthy river in the Cascade Mountains relies on healthy snowpack, but this vital resource is at risk as our climate warms. Despite this, water can seem abundant in Eastern Washington, where the Yakima Valley hosts salmon, generates hydropower and sustains a $2 billion tree fruit industry, etched out of the shrub-steppe each year. Eastern Washington doesn’t need much rain—so long as it has snow. Watersheds in the Eastern Cascades utterly depend on snowpack. Snow supplies 75% of runoff in the Yakima Basin, most of which arrives in the valley with the spring melt to irrigate the season’s crops and shepherd juvenile salmon downstream on their journey to the ocean. Communities of the Yakima Basin are intimately bound to its rivers and tributaries, and thus are highly vulnerable to a warming climate. Water security is at risk in every snowpack-dependent basin in the western United States. 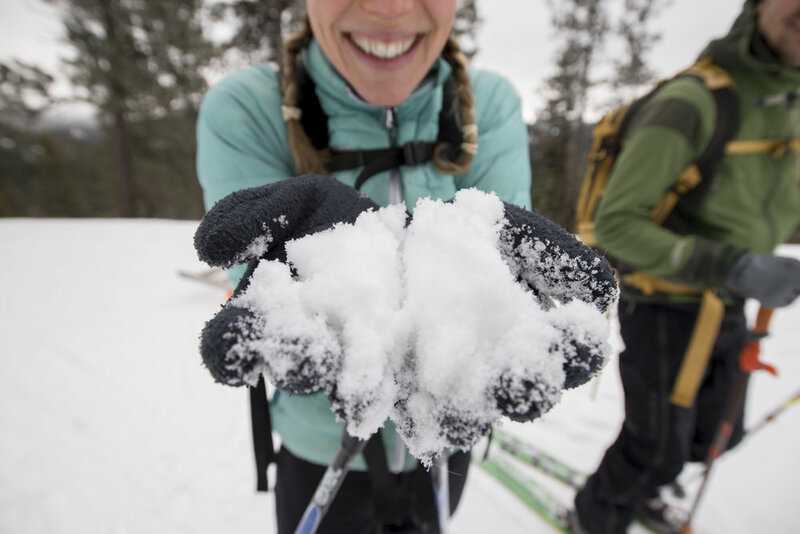 Scientists tapped SNOTEL data back to 1982 from 13 western states and found a 41% decrease in annual snow mass, with a snow season shortened by 34 days. Knowing that snowpack is dwindling, it’s time to figure out how we can adapt to drier conditions. One place we are exploring our climate adaptation potential is in Washington’s forests. In the Western Cascades, snowpack can be retained by opening up the forest canopy. In colder areas, like the Rockies, the equation flips completely, with an open canopy forest resulting in thinner snowpack, likely due to sunnier skies and brisker winds. Forest managers can apply these connections to maximize snowpack and therefore water. In the Eastern Cascades, there are no data linking the depth and duration of snowpack to tree canopy cover. This area represents a unique temperature zone where the snowpack-tree canopy relationship has not yet been explored. In the eastern Cascades, there are no data linking the depth and duration of snowpack to tree canopy cover. We don’t know whether it is better to have a dense canopy that shades snow in the spring an open forest that accumulates snow in the depths of winter. But we’re on it. For the next two years, we’ll track snowpack depth and duration in different forest types with cameras and temperature sensors alongside SNOTEL stations collecting data on snow depth and density, wind, temperature, precipitation, and irradiance. Scientists Emily Howe and Jamie Robinson traverse Blewitt Pass to reach snowpack monitoring sites in the Eastern Cascade mountains. Photo by Hannah Letinich. Forest ecologist Michael Case inspects snowpack near a research site on Sasse Ridge. Photo by Hannah Letinich. Now we cross our fingers that open canopies yield later melt-out dates in Washington’s eastern Cascades. That would mean our forest-thinning prescription for fire resilience matches our needs for water resilience. If they are at odds, well, then we need to get more creative about where we manage for water and where we manage for fire. Ignoring one or the other simply isn’t an option. This blog is the first in a series on snowpack and its importance to Washington watersheds. Part 2: Geek out on the tech as we head to the field and set up our research sites. Part 3: Explore the real-world impacts of snowpack loss on WA communities.